Everyone wants an edge, and police scanners can give you that edge! However, before you get a police scanner you should know whether or not they are legal in your area. They won't be able to give you the edge you need if you get in trouble for having it. Many people may think that a police scanner should be legal. It's only fair to let the public hear what police are saying through the scanner. However, there are restrictions in certain areas of the United States. 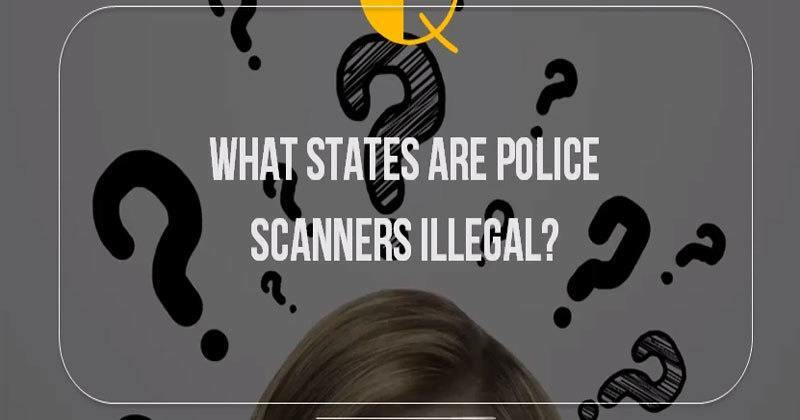 The remainder of this article tries the answer the question "In what states are police scanners illegal?". Essentially, you are not allowed to use a police scanner while driving in these states. This also applies to police scanner apps. The reason for this law is to keep people on the road from driving recklessly. Many people on the road use police scanners to know the position of police. Once they know the position of the police, they know where they will be able to speed and commit other crimes while driving. What this means is that in these states, if you use a police scanner to monitor the police while committing a crime, you will get an additional charge on top of the initial crime. The consequences depend on the state, and they range greatly. The good news is that most places allow you to listen to a police scanner in your home without penalty. Some cities, like Los Angeles, do require a permit. Look into local laws to ensure that you don't find yourself unknowingly committing a crime, but, in general, you are allowed to listen freely. Police scanners are generally open to the public to bridge the gap between the police and civilians. Plus, people listening to police scanners will be able to protect themselves from potential danger. While police are allowed to withhold information during an investigation, everything said on a police scanner is fair game. We have a right to know what is happening around us, and police scanners are a great tool for that.